We are very proud to say that our Airports Contracts Manager, Dan Byng, was named Demolition Manager of the Year at the annual National Federation of Demolition Contractors (NFDC) Awards. Having worked at Hughes and Salvidge for over 15 years, Dan has become the ‘go-to’ guy in the industry for Airport demolition. 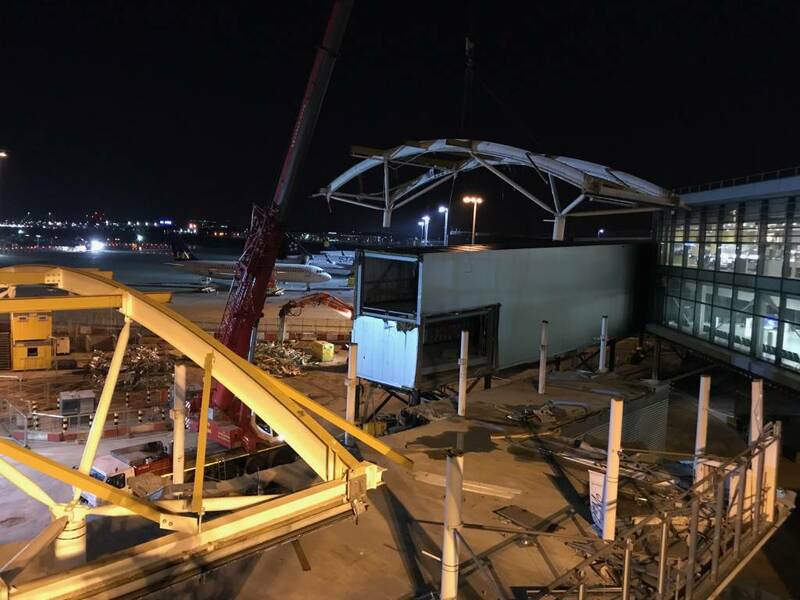 At the beginning of 2017, Dan set himself a challenge to complete 3 piers at Heathrow Airport. Not only did he achieve this by completing the demolition of Pier 3, Pier 4 and Europier for three separate clients, but he was concurrently at the helm of another high-profile project, the demolition of the West Pier at Manchester Airport. Although Dan can boast vast experience of managing and conducting works within a live airport environment and the subsequent restrictions and specialist approach this yields, the £1.9million Europier project was a particular stand out and one of the largest in Hughes and Salvidge history at an airport. After completing a previous phase in 2012, Dan managed the latest phase of the Europier project, a large-scale pier connecting Heathrow Terminals 1 and 2B, throughout 2017. The Europier was the larger element of 3 phased projects enabling the realignment of taxiways. The works consisted of soft stripping, crane works on all link bridges and demolition of all structures. Presented with specific and limited timeframes for the works, in keeping with the Airport’s operations and vision for the future, Dan conducted considerable consultations with Heathrow Airport, structural engineers and other stakeholders, and implemented detailed planning, preparation and collaborative working from the outset to ensure we hit every milestone date and were able to facilitate other trades carrying out programmed works on time. Night works were implemented to complement our day working – significantly supporting our ability to remain ahead of schedule. Working at night also enabled us to work around the Airport’s operations and avoid any negative impact. Road closures were necessary to complete elements of the project, and these could only be facilitated at night to avoid disruption. The crane work required on this project was specifically restricted to night time working as a 500-tonne crane was utilised to remove all the link bridges including a 70-metre section weighing 65 tonnes – after it had been stripped of 50 tonnes of concrete by our team. Simultaneously, Dan has been managing the £1million demolition works at Manchester Airport Terminal 2 and has been with the project from the very beginning of the tender stage, working closely with our Estimating and Business Development teams to compile a competitive tender laced with experience of busy airport environments. The Manchester Airport project commenced in August 2017, with works consisting of soft stripping of all buildings within the Terminal 2 demolition scope, separation and demolition works to the West Pier and demolition of the bussing area, trolley return areas on the West elevation and demolition of the forecourt ramps. Spearheaded by Dan, the Hughes and Salvidge team have undertaken a programme of day and night works in order to maintain the projected duration of 30 weeks, and, most importantly, undertake works during the night that cannot be completed during the day without disruption. Terminal 2 at Manchester Airport remains fully operational throughout the project, handling an average of 22,000 passengers a day (8 million a year). In the 15 years that Dan has worked for Hughes and Salvidge, he has progressed considerably through the ‘company ranks’, becoming a clear asset to our team. Congratulations Dan!